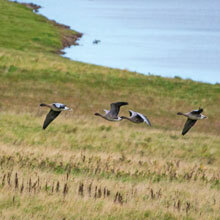 Skinflats is an RSPB reserve that is still very much under development. 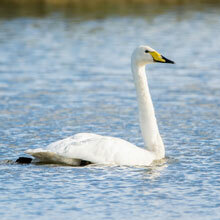 It is mainly saline lagoons and saltmarsh environment and a haven for thousands of wintering waders and wildfowl. 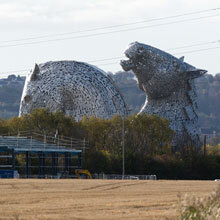 We hoped to see some of these as we parked in plain view of the impressive Kelpies at the other side of the M9 motorway. 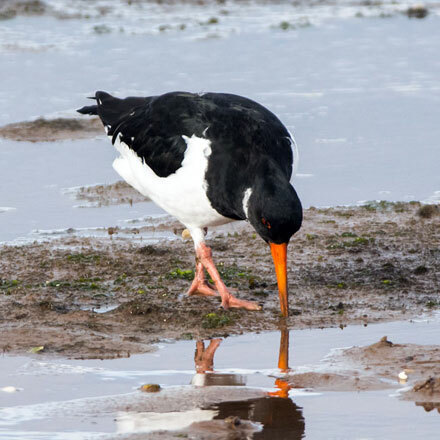 The site can be very muddy so we changed into wellies and plodded down a long, straight and rough road towards the salt pools. 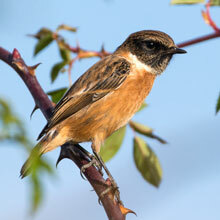 Almost immediately we came upon three Stonechats cavorting in the bushes. As they paused to check us out I took a few shots. 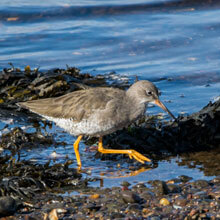 The light was perfect and I managed nice shots of the bold male and his more cautious female. 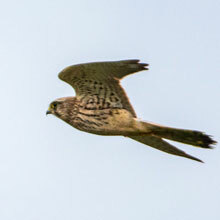 Soon after, a Kestrel turned up and started to hover over a stubble field – only to notice us and speeding off well out of range. 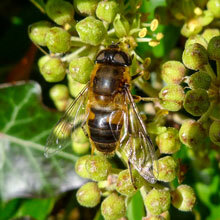 Still not 100m from the car, we were attracted to a sun-bathed patch of Ivy which was host to swarms of insects. 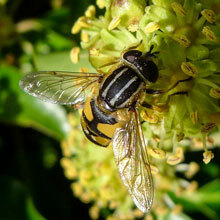 They were mainly hoverflies – Eristalis Arbustorum and Helophilus Pendulus (“The Footballer”’ - its the stripes! 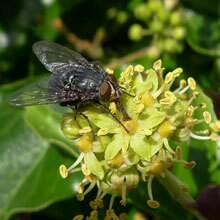 ), but we also caught pictures of the bluebottle, Calliphora Vicina and the Yellow Dung Fly, very common where there are cattle. As we explored a wooded area adjacent to the path for Redwing, we discovered what at some time must have been a small orchard of apple trees. 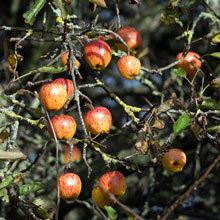 The trees were absolutely full of large, ripe, sweet apples. 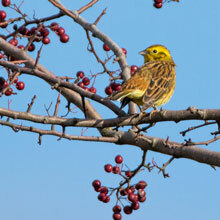 Only a calling Yellowhammer drew us away out of the orchard. 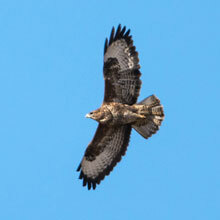 A handsome Buzzard emerged from another small wood and circled over the same field the Kestrel had surveyed earlier. 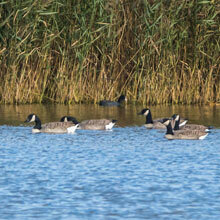 We eventually reached the pools where we found a dozen or so Canada Geese at the far side. We made our way around the pool towards the sea wall, or bank. 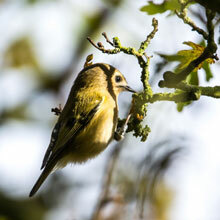 In the trees that lined the path a Goldcrest was nipping from branch to branch barely pausing long enough for a me to catch a shot. 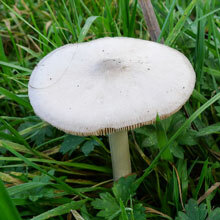 Eventually I was successful and we were able to move onto a small field where we found a lonely Stubble Rosegill mushroom near a patch of Common Ragwort. 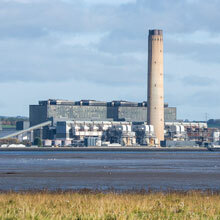 At last we scrambled up the very muddy bank and scanned the very impressive River Forth panorama, dominated by the Longannet power station across the Estuary. 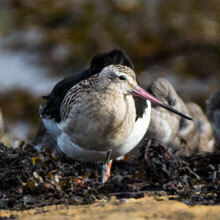 The tide was low and there were lots of waders, mainly Shelduck (regrettably too distant for a picture). 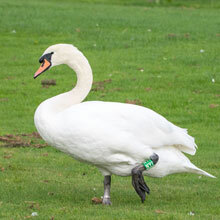 As we returned back around the pool, a beautiful Whooper Swan glided across our view, while at the far side a group of Mute Swans were nervously preening. 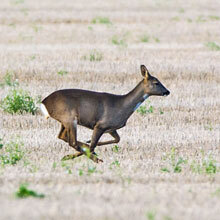 John spotted a pair of Roe Deer running across a field. They seemed to be running away from some threat or other although they hadn’t noticed us before they disappeared through a hedge into another field. Next we headed east along a very mucky, cow-trodden path past the second pool. 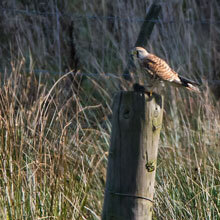 Only a pair of Curlew were there but even further east I snapped a Kestrel sitting on a fence post. 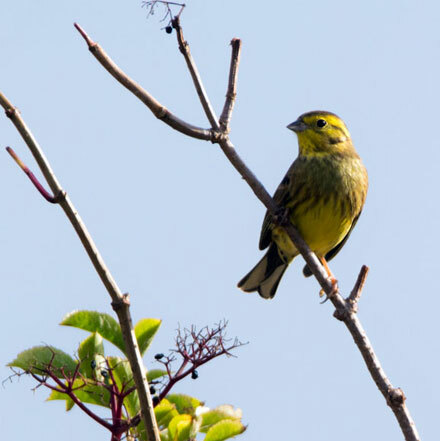 Perhaps it was the same bird we’d seen earlier. 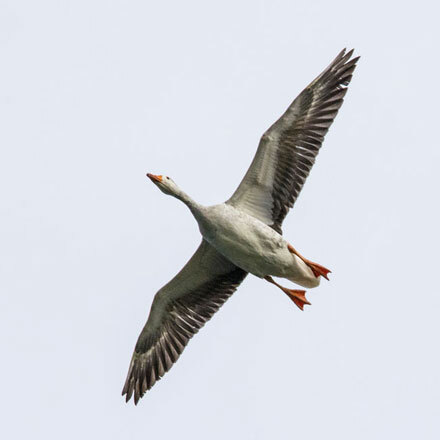 As we reached the single track road that runs parallel to the River Carron we heard the sound of hundreds of geese, probably Pink-foots, taking flight far to the west. 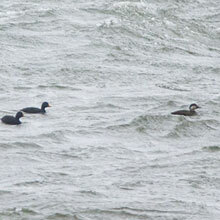 The odd group passed close enough for reasonable shots. 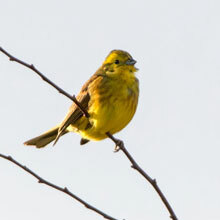 As we sat admiring that genuinely awesome sight and sound, Yellowhammers flew into a bush close to where we were sitting. 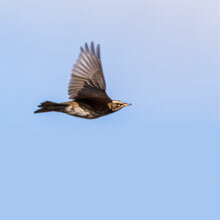 As I stalked them, a Redwing darted from the same bush. Back at the car our tea tasted great but we were slightly disappointed with our Danish pastries which were slightly undercooked. 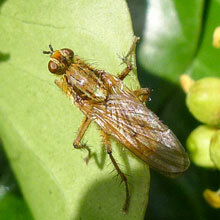 John had bought them after our very enjoyable Grangemouth Tesco’s breakfast (9/10). 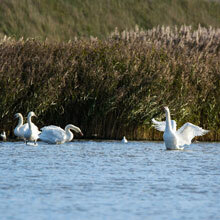 But it had been a very satisfying visit to a very impressive reserve. 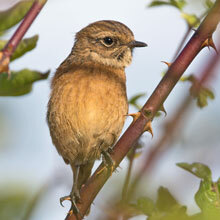 I do hope the RSPB don’t overdevelop it. 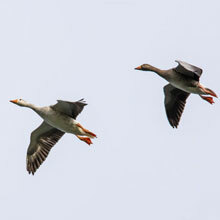 We were drawn to Whitesands Quarry, near Dunbar, by the promise of seeing the Bar-headed and Todd’s Canada Geese that had been reported there in the previous few days. 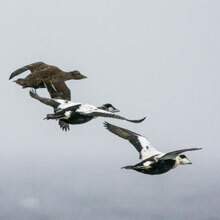 The weather was disappointing as it was very dull with periodic bouts of drizzle. However we were optimistic that we might get a little sunshine at some point in the afternoon. 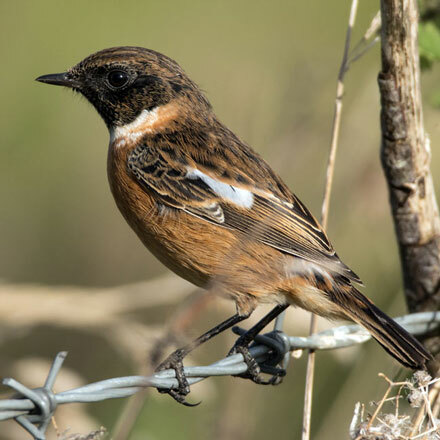 When we arrived we were faced with a more basic problem – most of the birds were at the distant far end of the man-made loch in the former quarry. We moved to that end, via a cycle path we hadn’t known about until a fellow photographer pointed it out. 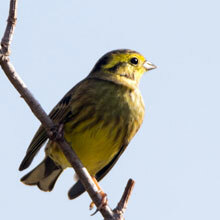 Our first capture of the day was of a Yellowhammer sitting on a bush at the side of the cycle path. It was probably tempted out of hiding by the arrival of the sun. 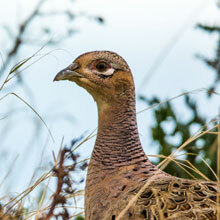 We were still about 150m from the birds, but a least the strong sunlight was behind us. 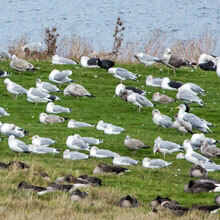 There were large flocks comprising Great Black-backed Gulls, Greylags and Herring Gulls. 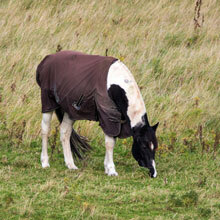 Below us, in the long grass, a domestic horse was grazing. It had a coat on but it was probably sweltering in the sunshine. 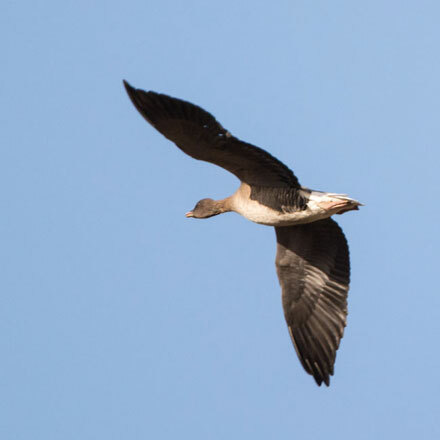 As I was snapping the distant Canada Geese, trying to determine whether any of those were of the Todd’s variety, a huge flock of Pink-footed Geese took to the sky. 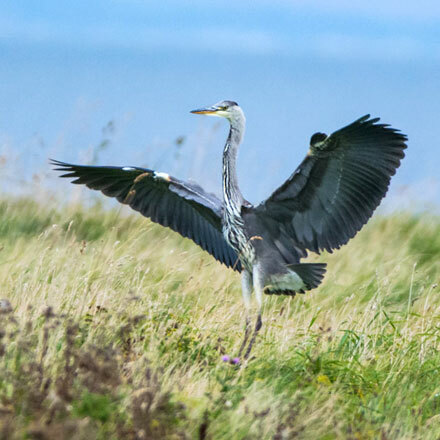 They had been out of sight on the slopes between us and the water – so I’m glad they took off or we’d never have known they were there! 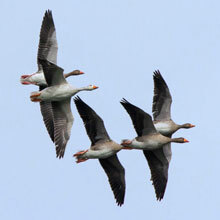 As for the Todd’s Canada Geese and the Bar-headed Geese, we didn’t see them. Oh well, never mind! 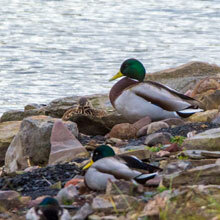 We returned to the hide at the other end of the Loch to check the groups of Ducks we’d spotted. 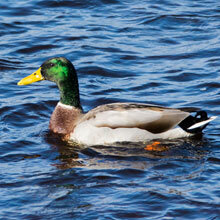 There were Pochards, male and female, lots of Tufted Ducks and of course Mallards. The lovely light had gone and the drizzle returned to annoy us. 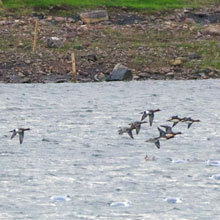 John drew my attention to a wee flock of Wigeon flying in from the sea. 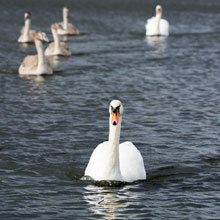 They settled at the far side of the Loch. 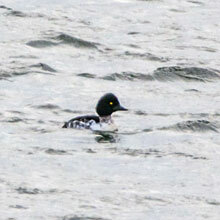 Just as we left the hide, John saw a pair of Goldeneye diving about 100m away. 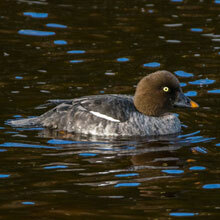 Even in the gloom their golden eyes stood out. 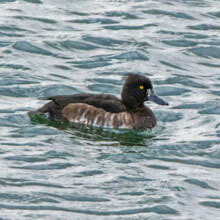 Not far from the Goldeneyes a smaller brown duck was diving. 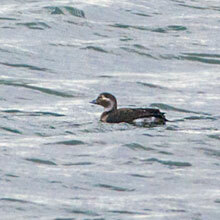 This turned out to be a female Long-tailed Duck. 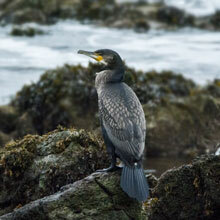 We made a brief stop to check out the beach for any birds. 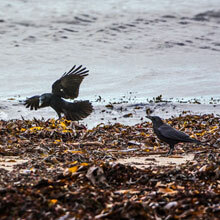 Only a pair of Carrion Crows caught my attention as they tried to smash shellfish by dropping them from the air onto rocks. 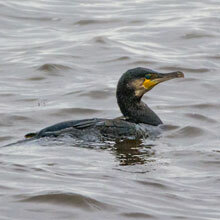 As we drove further east towards Barns Ness I had to stop the car a couple of times to take pictures of birds. 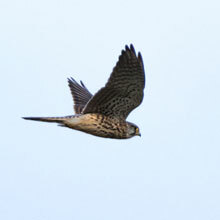 First spot by John was a female Kestrel. He took the pictures once I’d safely parked and turned off the engine. 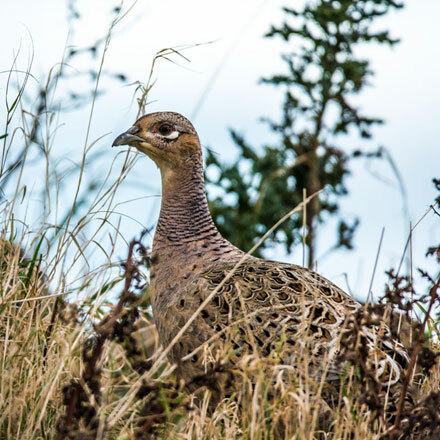 Next spot and picture en route was again by John – a female Pheasant that thought it was invisible if it stood perfectly still. 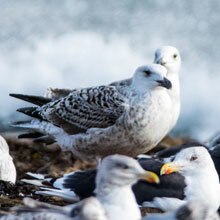 After parking at the Barns Ness car park we walked around the Wire Dump. 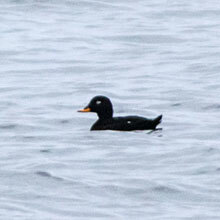 John pointed out a large rock offshore occupied by a Herring Gull and a female Goosander, but the bushes were very quiet maybe due to the low light levels. But as we entered the old caravan park John’s eye (yes he certainly had his spotting eye in for this trip!) 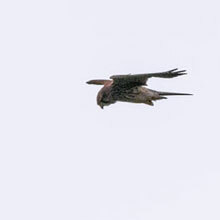 glimpsed a female Kestrel streaking above the bushes. 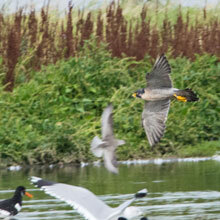 I managed a couple of shots even although it was darting about for only a brief moment. We then arrived back at the car for tea and delightful danish pastries filled with cream and apple. We headed home fairly satisfied – but we had a final surprise. 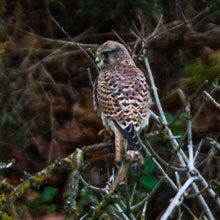 We came across the female Kestrel resting in a tree by the exit. Lovely. With the west of Scotland under a depressing grey cloud we headed for the sunny east. Skateraw was steeped in sunshine and although the wind was fairly strong it wasn’t cold. So it was great condition for a wee stroll around the bay. And it wasn’t long before I was snapping away. 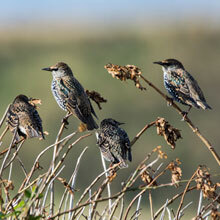 My first target was a small flock of Starlings, mainly juveniles. 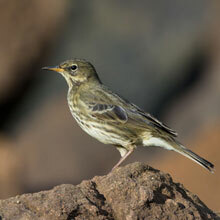 As we made for the rocky Point where we had observed a congregation of birds, a pair of Rock Pipits seemed to track us. 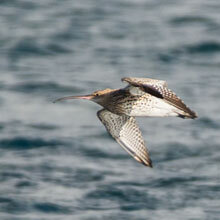 As we sat by the rocky shore, first a Cormorant, then a Curlew flew in to swell the numbers. 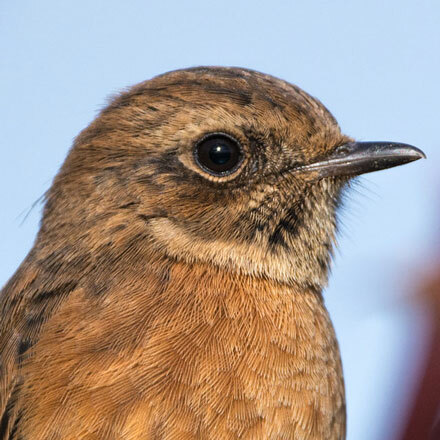 I slowly and carefully sneaked a bit closer to the birds and sat on my 3-legged stool (I have found that birds are not as liable to fly off if I’m sitting). The wind was whipping up the sea, creating big waves that broke onto the rocks throwing up exciting packets of spray. 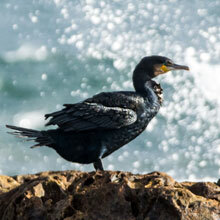 A Cormorant sat just beyond the spray making a nice photographic subject. 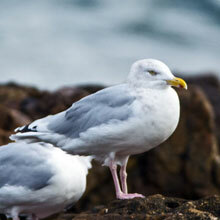 A large group of gulls – mainly Great Black Backed juveniles and Herring Gulls, were huddled down facing into the wind. 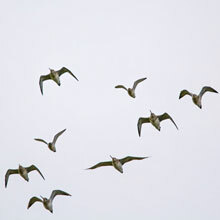 Similarly, a half dozen or so Bar-tailed Godwits were grouped low and close together and all but one had their beaks under their wings. 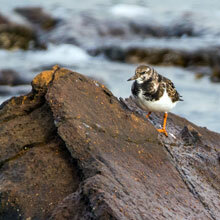 I retreated to the grassy bank, passing a lone Turnstone perched on a rock. It was obviously unconcerned by the wind and waves. 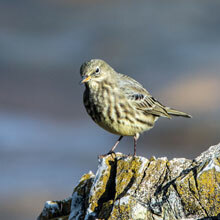 The Rock Pipits were still checking us out as we made our way back to the car park. 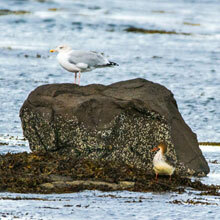 We unconsciously disturbed a Curlew that had been sheltering between the large rocks on the shore. 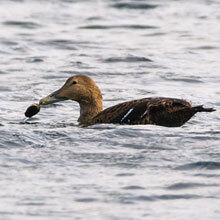 Offshore a female Eider was picking off a crab’s legs before downing the whole shell. We moved west to the rather more calm Belhaven Bay. 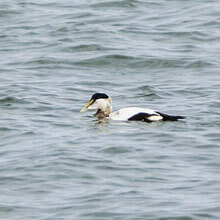 The tide was on its way out and the inner Bay was filled with a variety of species. 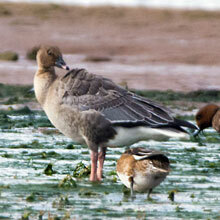 I spotted some Wigeon dabbling in the shallows and through his binoculars John spied a pair of Pink-footed Geese. 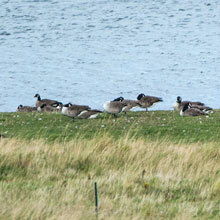 The geese seemed a bit out of place there. 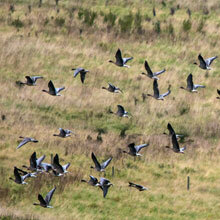 It was more usual to see them in a large flock on a hillside. 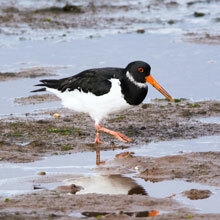 We walked by the seawall watching the ever-present Oystercatchers and Redshanks going about their business. 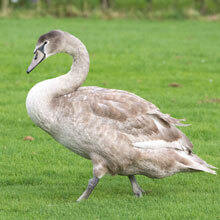 At the Seafield Pond there were other ever-presents - a family of Mute Swans, always photogenic. 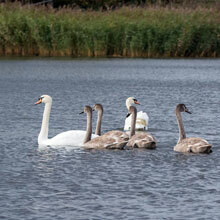 The 4 cygnets were almost fully grown but were still following their parents as if connected by invisible tow lines. 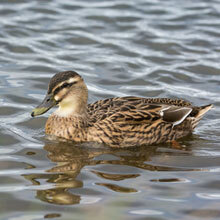 Other familiar birds at the Pond were Mallards, Little Grebe and Teal. 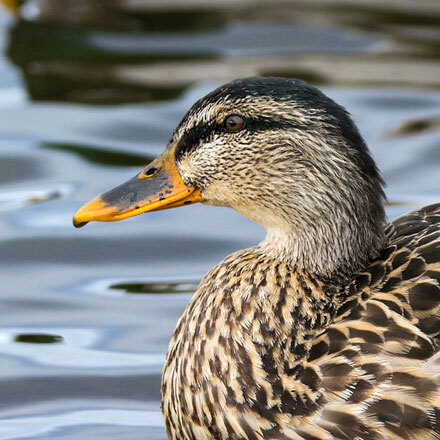 The Mallards, like the Swans, were inquisitive to find out if we had any goodies for them – no chance as John and I rarely feed the birds we observe. 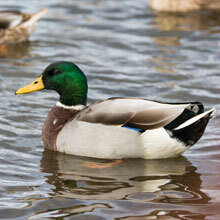 John remarked that the Teal looked unfamiliar. 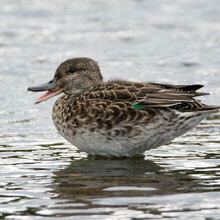 This was probably due to their current eclipse phase plumage and maybe its small size – Teal are the UK’s smallest duck. We returned to the car fairly satisfied with the day’s collection of pictures, although we hadn’t had any unexpected sightings, other than perhaps the Pink Foots. It had been a very pleasant trip, and to round it off, with our tea, John and I consumed fruit scones with cream and jam. 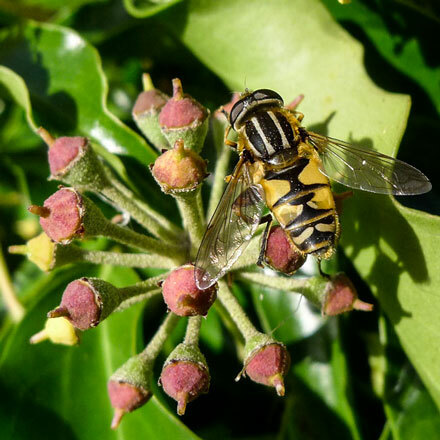 At our ages – naughty, but nice! It was cloudy as we drove east to Dalkeith Morrisons for our Sunday breakfast before heading for Musselburgh. I told John that cloud was predicted to clear by the time we’d leave the cafe. As it turned out, that was just a bit later than anticipated as the service was very slow. 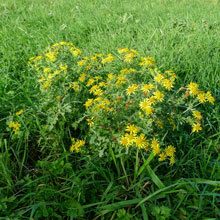 However we did leave well satisfied with the meal (8/10), and also satisfied with the weather – clear blue sky! We belted round to the mouth of the River Esk eager to get our walk underway in the fine morning light. 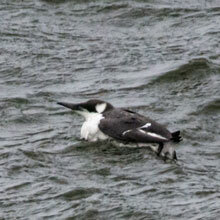 Our first sighting was a lone female Goldeneye diving in the Esk. 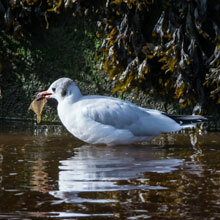 On the far bank a Black-headed Gull was consuming a small flat fish. It took some time to figure out how it was going to get it down. 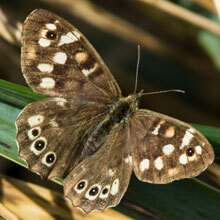 John then directed me towards a Speckled Wood butterfly resting obligingly on a blade of grass. 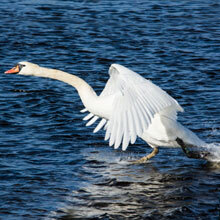 Next, several Mute Swans flew up the river from the shoreline. 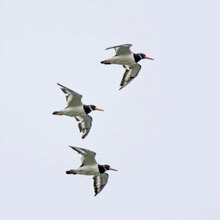 They made an impressive sight in the strong sunlight backed with the blue of the sky and sea. 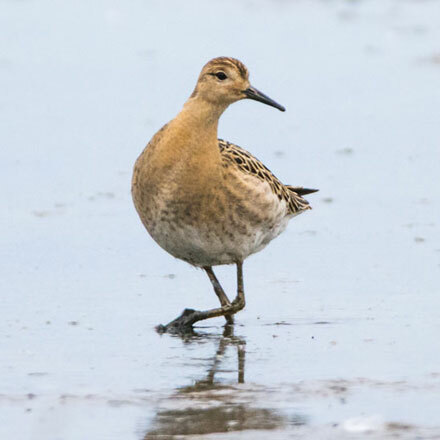 As we tracked round the seawall making for the Scrapes we met the expected birds – the ever-probing Redshank, the solitary Curlew with an unlucky Shore Crab and the ubiquitous, underrated Mallard. 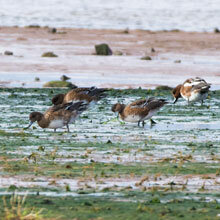 We also saw a small flock of Wigeon. 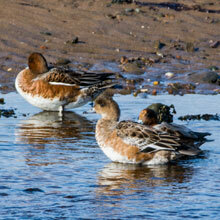 They were in shabby-looking eclipse plumage but it was nice to see them as they soaked up the sunshine on the shore. 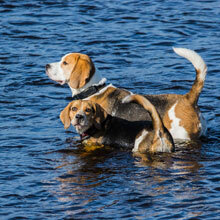 Our viewing enjoyment was abruptly interrupted by a pair of barking beagles accompanied by their inconsiderate owners. 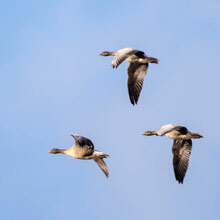 All the birds fled and we plodded east before I yielded to the temptation of shouting abuse. 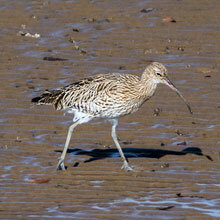 We did see another Curlew at the far edge of the beach. It seemed less than concerned with the commotion. 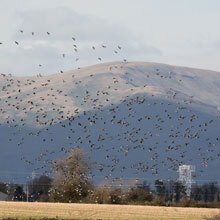 As we reached the seawall just by the Scrapes a large flock of about 40 Greylags passed noisily overhead. 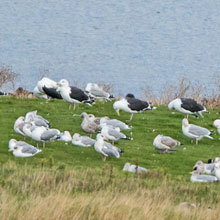 In amongst them was a leucistic individual, or perhaps it could have been a hybrid. 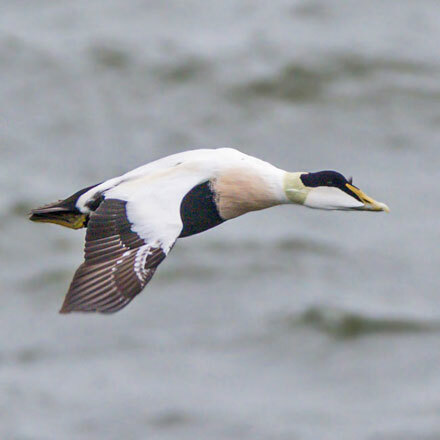 In the sea we saw more familiar birds- a young Sandwich Tern catching a fish, a passing Cormorant, a male Eider and a female Goosander. In the time it had taken to walk to the Scrapes, the blue skies and sun had disappeared, replaced by ever-deepening grey clouds. 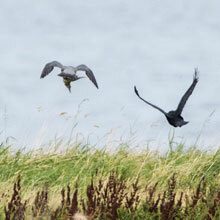 As we entered the Scrapes I recalled my previous visit there 2 days before when I had witnessed a Peregrine taking a Ruff. 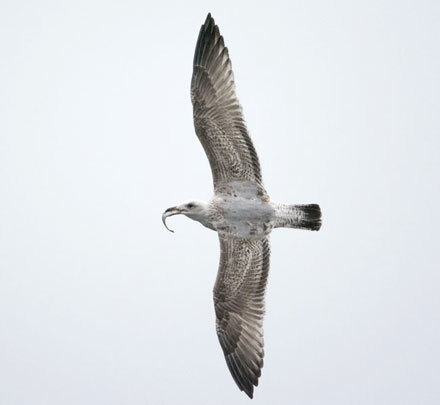 It circled over the Scrape several times picking out it's likely prey then it swooped dramatically and in a splash carried off its poor victim to meet it's fate. 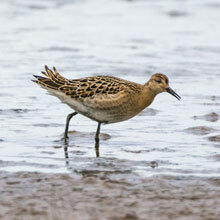 On entering the far right hand hide I immediately saw a Ruff foraging very close in. 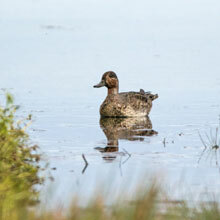 Behind it an eclipse Teal was lurking. 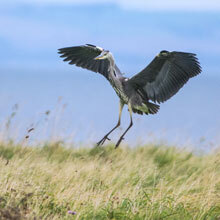 A Grey heron flew in from the east and landed a the back of the Scrapes. 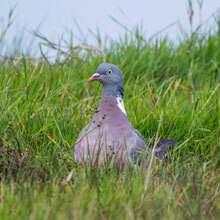 In the short grass below the hide a Wood Pigeon seemed to be wondering if it should fly away from the noisy creatures in the hide that were pointing clicking machines at it. Eventually it did. 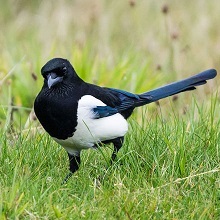 Not so a Magpie that was beside the pigeon. It boldly strode closer daring us to bring it on. Eventually we moved to the leftmost hide. 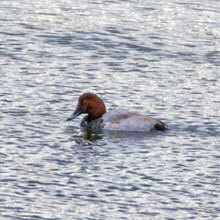 The light had deteriorated badly and it was hard to make out plumage markings. 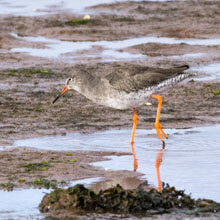 There was no mistaking the Spotted Redshank though. 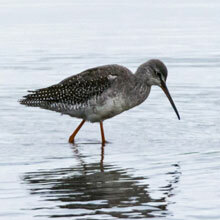 It had a distinctive silhouette with longer pointed beak than the Common Redshank. 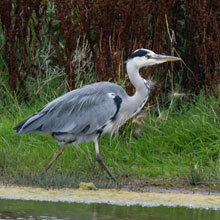 On the same Scrape another Grey Heron emerged from the reeds cautiously stalking the shallow edges of the pool. 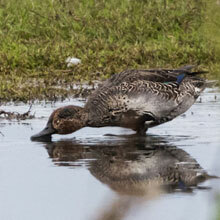 Beside it a Teal was unimpressed as it dabbled the same stretch. With the light poorer than dull we set off back to the car returning along the same route. 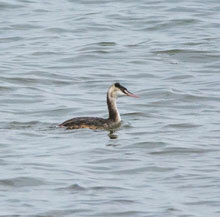 About 100m offshore two pairs of winter plumage Slavonian Grebes and Great Crested Grebes were diving. 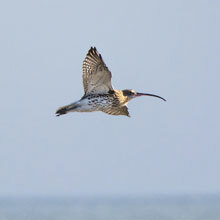 As we walked we were met by wave after wave of Oystercatchers and Curlew returning from the incoming tide on the shores to the shelter of the Scrapes. 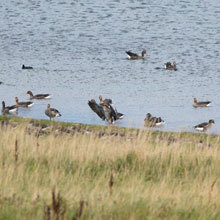 Several “squadrons” of Bar-tailed Godwits were amongst these birds. 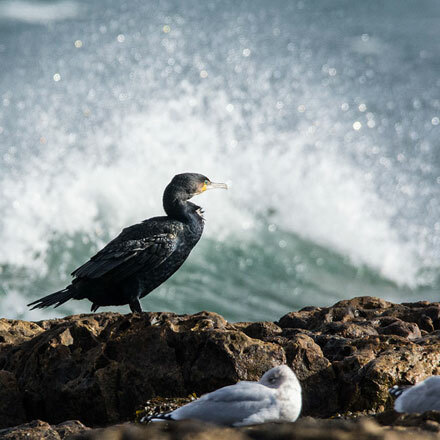 Meantime on the sea a Cormorant didn’t seem to be at concerned with the tides as it made dive after dive into the gloomy sea, only occasionally surfacing with fish. 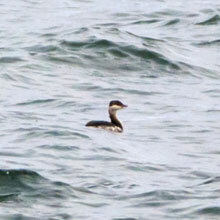 Much further out Velvet Scoter had appeared. 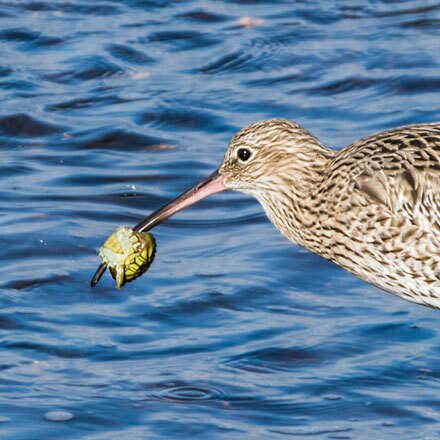 I often wish they would sneak inshore for just one quick photo! Maybe one day. 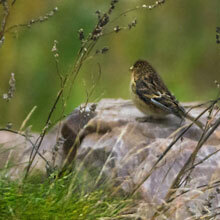 My final picture was of a solitary Twite. 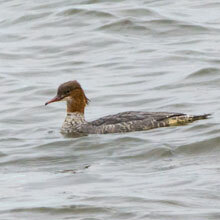 It wasn’t close and the light was dreadful, but there was no mistaking its posture and tell tale yellow beak. At the car our warm teas and Danish Pastries were very welcome in the stiffening breeze. We discussed our great haul of pictures and also how much of a nuisance irresponsible dog walkers are. And to cap off a super day, the traffic was very light on our way home. The weather prediction was, well, abysmal. 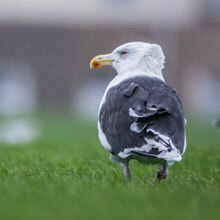 Coast-to-coast rain, high winds, no sunshine – not exactly conditions conducive to achieving fine photographs of nature. However we accepted the challenge and, if nothing else, we would get a hearty breakfast in Stevenston Morrisons, one of our favourite and most reliable cafes. Stevenston Point was our first stop. 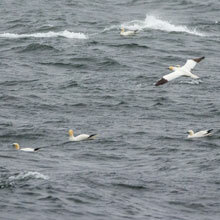 To our surprise there was a lot to see, albeit through persistent driving rain. 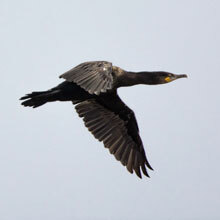 I got a nice shot of a Cormorant during a rare, brief, dry episode but soon we realised that I could take shots out of my open car window as the wind was battering John’s side of the car. 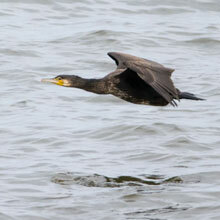 He became the “spotter” and I captured images of the birds as they passed. 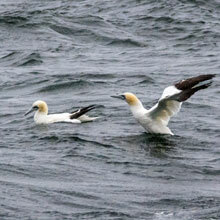 There were frequent passes of Gannets and the odd sets of Eider. 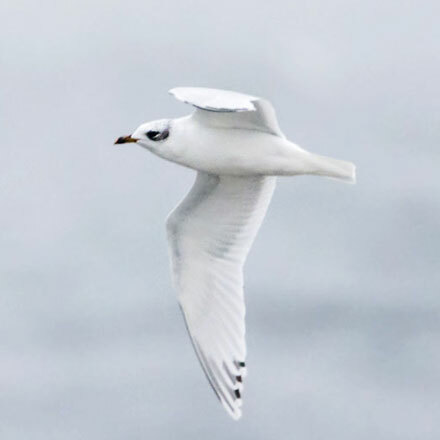 I captured a lovely shot of a lone Mediterranean Gull (see Photos of the Week below). 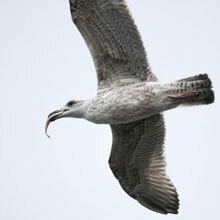 I caught a 1st cycle Herring Gull with a fish in its beak as it frantically tried to evade other Gulls that were trying to steal its dinner. 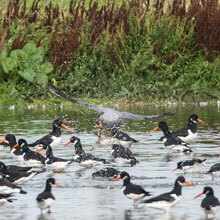 Eventually it dropped it and they all got nothing (there’s a moral there!). 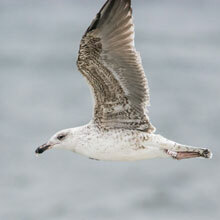 A striking 1st cycle Great Black-backed Gull hovered into the gale allowing me to get most of it on record. 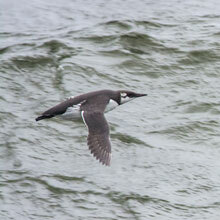 Offshore a Common Guillemot bobbed up and down looking very small and vulnerable but I dare say it was in its element. 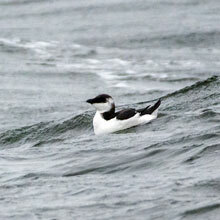 Not far from it was a juvenile Razorbill riding the waves with consummate ease. 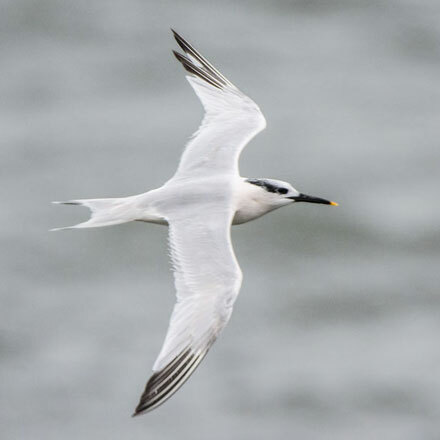 Very active around the Point were Sandwich Terns, their familiar creaky calls giving the first sign that they were passing. 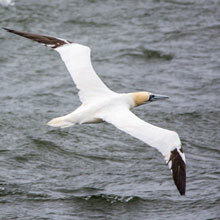 We watched them for half an hour then suddenly it appeared there had been an invasion of Gannets. 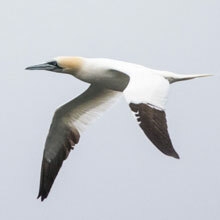 Where they came from was a mystery at the time but thinking back I reasoned that they must have been on the surface of the sea and on seeing a few passing Gannets diving successfully, they had taken to the air to join in. 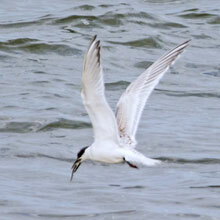 Like the Gannets, the Terns dived dramatically into the rough sea, only occasionally surfacing with the prize of fish. 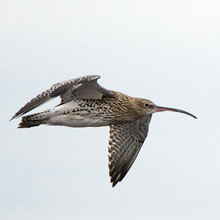 After an hour or so of watching the Gannets we tired of hiding from the weather and decided to check out Saltcoats Harbour to see if any waders were sheltering there. 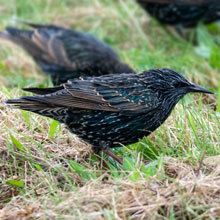 As we drove off the Point we came across patches of Starlings probing the grassy areas for worms. 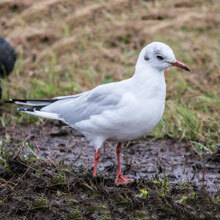 A smart Black-headed Gull was amongst them, treading the grass, simulating raindrops to fool the worms into coming to the surface – a bit unnecessary given the weather! 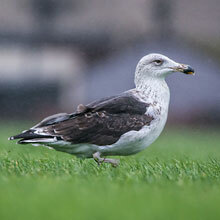 In a playing field a few Great Black-backed Gulls were also hunting for worms. 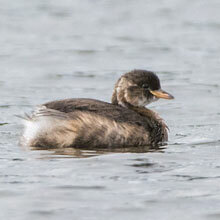 These included a 2nd cycle individual, its adult plumage almost complete. 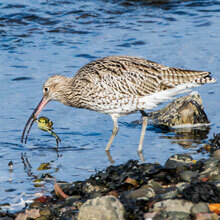 At Saltcoats Harbour conditions improved slightly. It wasn’t as dull and the rain had stopped. 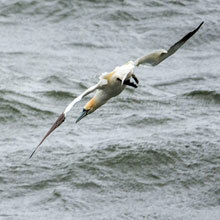 It was still very windy though, not that it bothered the numerous Gannets that passed by the small tower at the end of the Harbour. 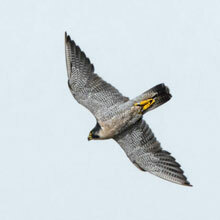 We observed from there for an hour and were pleasantly surprised how sheltered we were there. 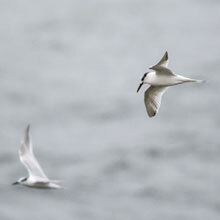 The passing birds got very close as they flew low around the Harbour walls, sheltering from the winds. 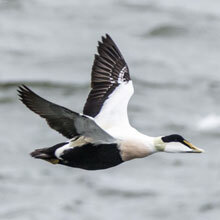 Eider, Sandwich Terns and Common Guillemot came within camera range, but further out John spotted a flock of Common Scoters diving in the heaving surf. So our original expectations of coming away with nothing more than a guid Scottish Breakfast turned out to be over-pessimistic. 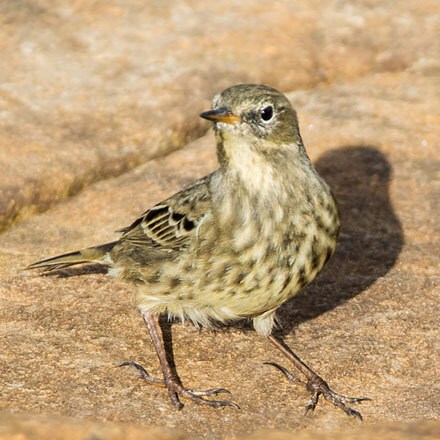 The birds rose to the occasion and we were there to capture the moments. 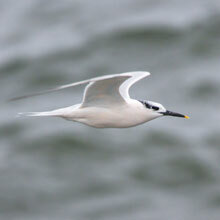 We had to have our tea in the car though as the rain made one last attempt to waste our day – no chance! John had provided scones with real cream which disappeared far too quickly. The Sun had the audacity to make an appearance as we drove home. But it didn’t matter as it had been great fun without the sun – poetry!